Much is written about the virtue of the Gamma Match, and near as much about how they work, and the difficulty in design and implementation. Designing a Gamma match using a Smith chart showed a design method for a simple Gamma Match using a Smith chart as the design tool. This article visits the implementation on a pair of antennas that I built 50 years ago, and are still in use today (albeit with some small preventative maintenance once during that interval). 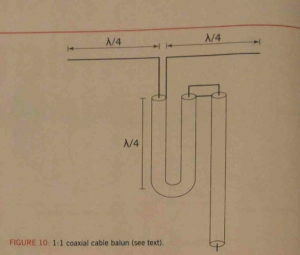 The basic antenna is a four element Yagi for 144MHz copied from an ARRL handbook of the time, probably based on NBS 688. 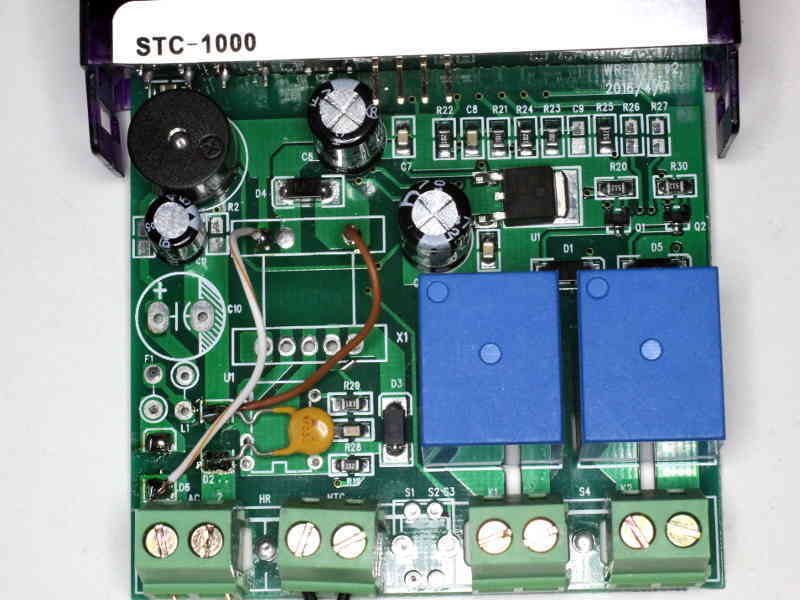 It was designed to deliver a split dipole feed point impedance of 50+j0Ω. I built them using a Gamma Match, partly to get some familiarity, but mostly to implement a Gamma Match that was reliable, weatherproof and lasting… features that are alien to most implementations I had seen at that point. Both antennas were constructed and the Gamma Match adjusted for VSWR<1.1 using a Bird 43 directional wattmeter. 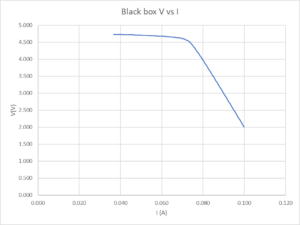 The dimensions of each (including the key gamma dimensions) are the same, not surprising, but a confirmation of repeatability. 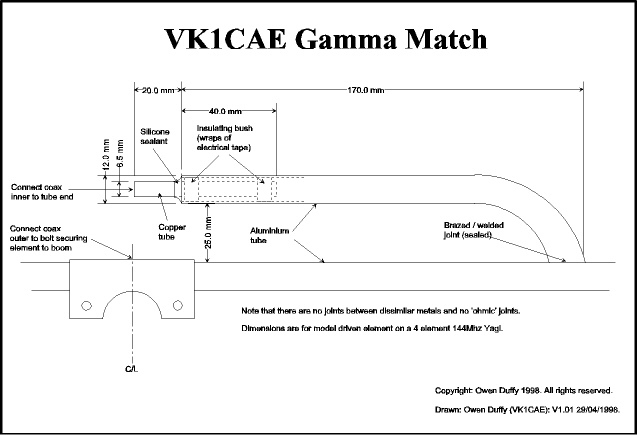 See Novel Gamma Match Construction for more discussion. A correspondent asked for an explanation of a novel balun described in Radcom Feb 2019 by K3MT. 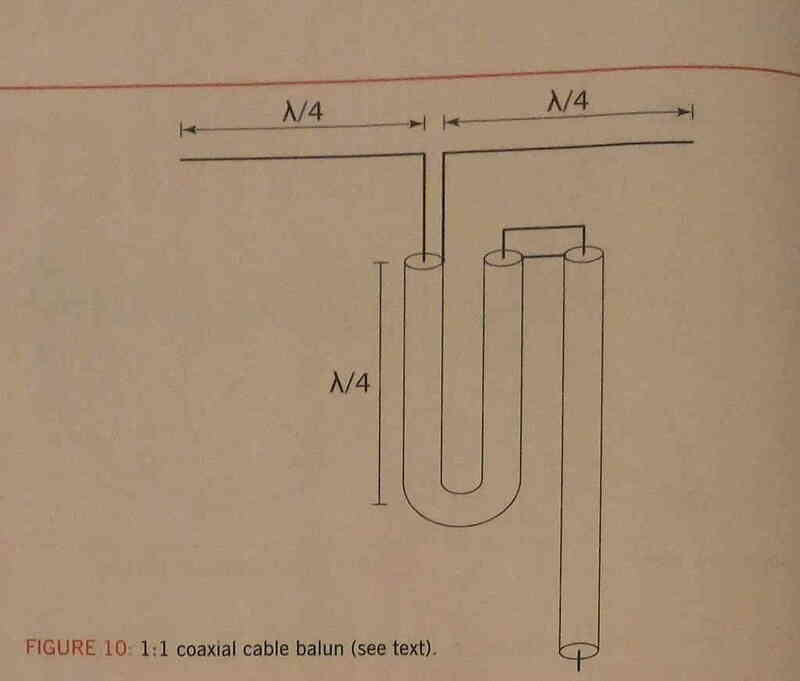 Above is a diagram of the so-called “cable balun”. This article canvasses the issues of the display. Intention is a digital based display (though not to exclude an analogue meter or bar graph type displays). So, the output of the AD8307 needs to be digitised. Let’s first consider the nature of the AD8307. It is a log detector, so it provides a ‘DC’ voltage proportional to the log of the input signal, but the ‘DC’ voltage can vary very quickly. K0KA made a quite polished presentation published as a Youtube video explaining how to measure balance performance of an antenna system and an ATU. He did not define what he means by balance… but it will become apparent. Midway through his video, he measures the ‘balance’ of a Palstar AT5K (though possibly modified) by connecting a symmetric load consisting of two 470Ω 2% resistors in series and connecting the junction to the ground terminal on the ATU. Above, from KA0KA’s video, his test load. 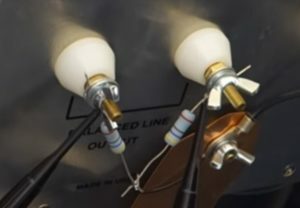 The oscilloscope probes can be seen. The oscilloscope channel gains are carefully adjusted to be equal. KA0KA shows two oscilloscope measurements. VU3SQM offers an interesting directional coupler based on a Sontheimer coupler, and using AD8307 power sensing for a nominally HF coupler. I must say that I am not a fan of Sontheimer couplers… but that is what the board uses. 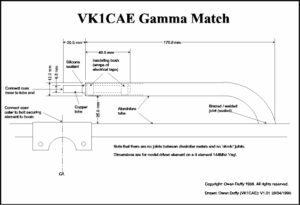 This article lays out a preliminary design review to assist in selection of appropriate toroids, and ordering of the needed parts. Elecraft produces a directional coupler that may interest QRP aficionados. 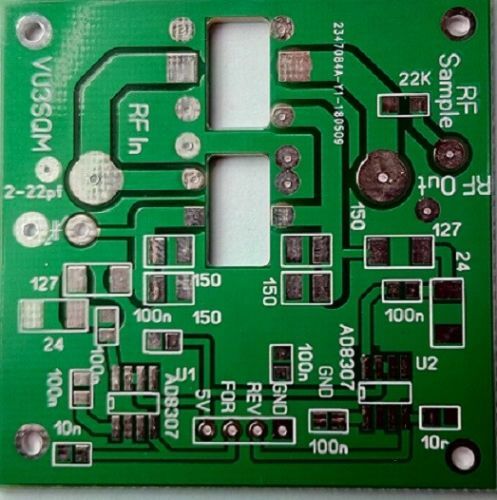 It comes with instructions for 20dB and 30dB coupling factors rated at 25 and 250W respectively from 1 to 30MHz. 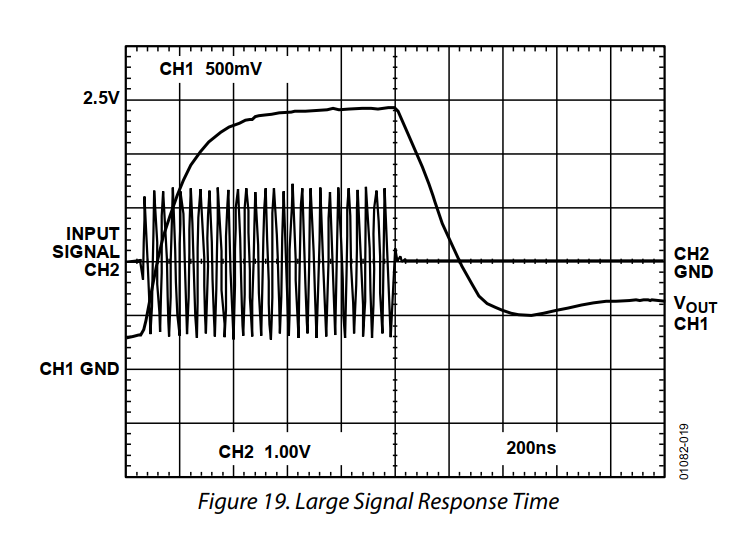 This article reviews the magnetics design of the -20dB / 25W coupler. We have had wired broadband service delivered to these premises for almost ten years, supplied by five vendors: Telstra Bigpond, iiNet, Amaysim, Southern Phone and now Exetel. 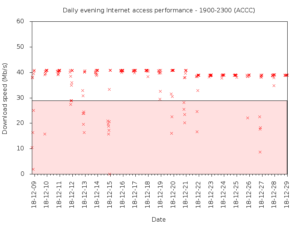 At The first seven days of Exetel broadband Internet access I discussed the performance failure of the service observed over the first seven days. 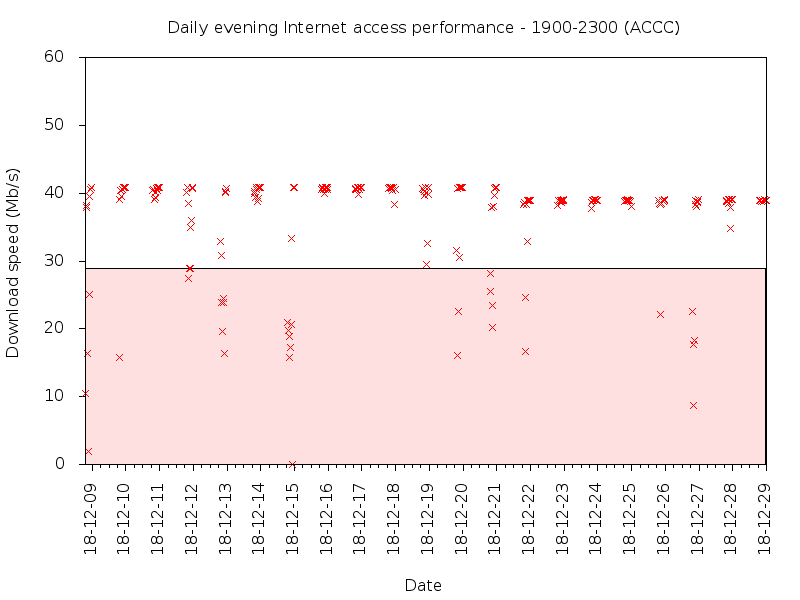 Following that, a fault report was submitted to Exetel, and at their request, further observation of speed and ping test latency. I have an expectation that “I want it to deliver most of the rated speed, most of the time during the hours that I want to use it”. As a result of behaviour of the industry, the ACCC gives some guidance on terms used to advertise a service, and a service expectation. So on that measure, how well did they perform? 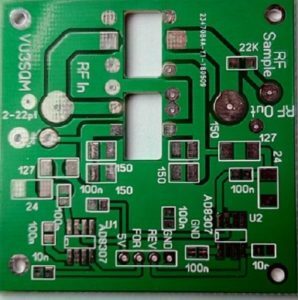 I have an inexpensive (~$10 inc post) digital temperature controller that was observed to have very high RF emissions and was unusable because it was incompatible with radio operations here. There has been enhanced firmware for a STC1000 controller based on a PIC chip, but in my experience, most seem to be made with an STM8S003F3 chip. More recently, what appears to be a port of the PIC software to STM8 has been published at https://github.com/Emile666/stc1000_stm8. The enhanced firmware is directed at home brewing for control of long running fermentation processes etc, incorporating storage for a number of multi-step programs (profiles). It is not really suited to more general applications like a fridge controller as for example it is more difficult for the common operation to set the set point. I thought it might be entertaining to try it out. Installation of the firmware was straight forward, I had the necessary programming adapter and software. Interestingly, after updating the firmware, the device would not start on its original power supply. My suspicion is that the new firmware runs the LED display at higher duty cycle and the power supply could not withstand the load. Since the power supply had RF emission problems, it was removed and the device converted to 12V DC. On Thevenin’s theorem looked at a simple source network to demonstrate some key characteristics and limitations of Thevenin’s equivalent circuit. The example network used was linear in V,I for all V,I combinations possible. Let’s now look at a network that is not linear for all V,I, but is sufficiently linear over a sub range to be usefully modelled using Thevenin’s equivalent circuit. 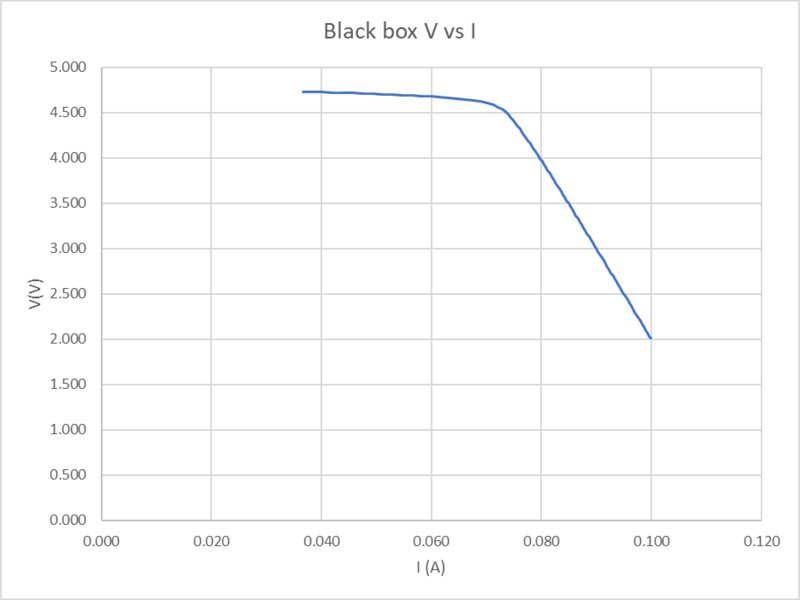 For the purpose of discussion, we have a Black Box with just two terminals and is a source of DC voltage and current, and the internal implementation is hidden from us. A series of measurements is made with different load resistors attached and the voltage and current at the terminals is recorded and plotted uniformly stepped currents. 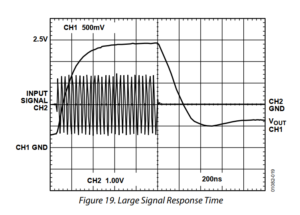 Seeing another long running discussion on QRZ about transmitters and antennas, and maximum power transfer and Thevenin equivalent circuits prompts some discussion.